The 300x CP system incorporates state of the art media sensing technologies to produce superior quality labels on media as narrow as 1.5 inches. 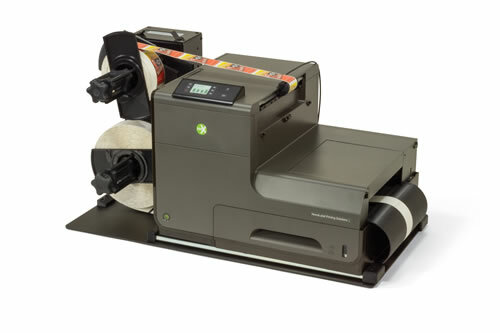 The NeuraLabel 300x C-Path (300x CP) is an easy to use roll system that can produce labels on some of the narrowest media available, but it is also flexible enough to print on 8.5" wide media and every size in between. The 300x CP's strength is in its flexibility and its speed comes from it's simplicity. It has been designed to handle continuous or pre- die-cut rolls of label media with the NeuraLabel 300x Printer allowing you to produce full-color professional labels that are durable and grab attention. With unparalleled support, NeuraLabelâ€™s 300x CP is exactly what you need to print your labels quickly. Media Width 1.5" - 8.5"
To find the best media for your needs search the NeuraLabel Qualified Media database. To order media for your NeuraLabel printer see the list of NeuraLabel Media Partners. Contact support at support@NeuraLabel.com or 281.207.8555 x1.